We are from iowa , I am an NREMT-I been in EMS for 10 years. My partner is a Deputy Sheriff of 11 years. We are new to the group, and wondering if any other Iowans, Minnesota people are here. We look forward to being part of this forum. WOW... well, HOWDY IowaEMT and DepSherf!!! 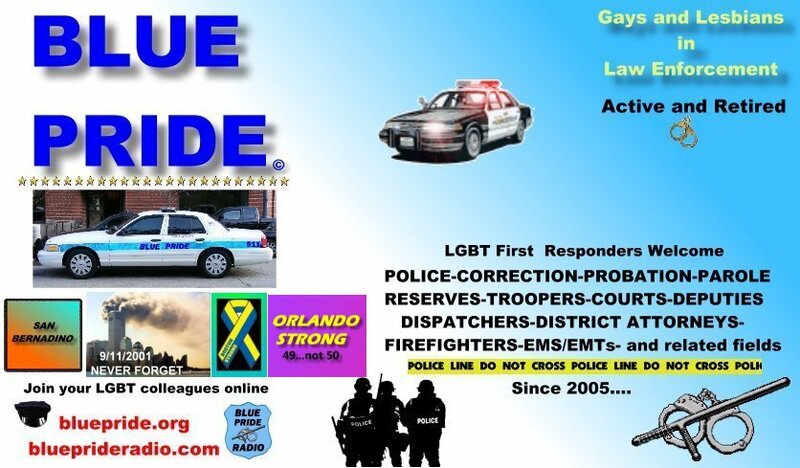 We have several partner couples here on BluePride but I can't think of any who are BOTH in the disciplines we represent. Postings have been a bit sparse recently so we are delighted to have new members. Maybe others in our ranks will remember to sign in and post as well. About the Annual Conference sponsored by various GOAL groups and LEGAL International... Sadly, they have dropped the ball the last couple years. The Las Vegas Conference was cancelled. The Toronto Conference was cancelled. And, we been advised the next Conference won't be until 2016 in Amsterdam. The Amsterdam group is VERY motivated and professional, however. I was very impressed with them at the last Vegas Conference back in 2010. They should do a great job when they host the Conference, albeit not until '16. Do jump in anytime. We're a FUN group. ... and we also address some very serious issues that bring much heartbreak and stress for LEOs... and many issues that bring great JOY. Sooooo... DO let us hear from you often! Ball6542 is in DesMoines. You can look him up through the Members section and send him a direct message through there. That is the only other member I am aware of in Iowa. There may be more, but not everyone is as open about their location. Welcome to the site. I am also Law Enforcement with Hillsborough County Sheriff's Office here in Tampa, FL, but like Bear stated above, my other half is not law enforcement/safety related. I started in detention, moved into the law enforcement side, then into latent investigations where I am currently assigned. As one of the semi-regulars on the site, I hope you find an interest in many of the VARIED topics in the threads here and are comfortable expounding on it. Since you will probably be looking at many of the older threads to get an idea of what we are about, feel free to bring that thread to life! Just because it hasn't been commented on in a while, doesn't mean a new perspective won't bring it back current and spark a lot of input. A belated WELCOME to the site! Bear and Dale pretty much gave a welcome that I could not top, so....WELCOME again!